this module allows rearranging audio(loops). 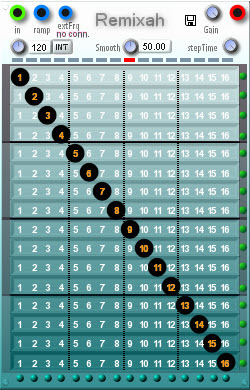 incoming audio is cut into 16 slices (the rows, see pic). these slices can be moved in the time domain (the columns). nb: if no extFrq (eg from syncstation) is connected to the resp. input and bpm is set to “ext”, an error message will show up (division by zero”). with this module, audio loops can be freely rearranged. incoming audio is cut into 16 slices; every slice can be positioned freely and (unlikely Remixah) as often as wanted. use of audio ramp strongly recommended. example patch here, discussion on planetz here. As above, for two inputs.